We saw five films this last week: The Guilt Trip (Barbra Streisand/Seth Rogan), Parental Guidance (Billy Crystal/Bette Midler/Marisa Tomei/Tom Everett Scott), Argo (Ben Affleck, John Goodman, Tate Donovan, Victor Garber, Chris Messina, Bryan Cranston and Alan Arkin), and finally, the funniest movie in 2012 (IMHO), This is 40, (Paul Rudd/Leslie Mann/Melissa McCarthy/Albert Brooks/John Lithgow/Megan Fox/Jason Segel/Chris O'Dowd). The film was produced, written, directed by Judd Apatow, of Bridesmaids (producer), Knocked Up and The 40-Year-Old Virgin, among many successful movies. I think this film was remarkable on many levels. First, the script. Even though it chronicles of a white privileged couple in LA with very priveledged lives, compared to the ruinous world most of live in, I still found the film to be something I could relate to (even though I'm now 50) and very erudite. script and direction). Paul Rudd (the most under-lauded actor on the planet in my opinion and a total hottie) and Leslie Mann. This was perfect casting because both actors have consummate comedic timing and a great onscreen chemistry. They carry this movie with a cast of supporting brilliant actors. The movie is the story of Pete (Rudd) and Debbie (Mann) who are celebrating their 40th birthdays in the same week. They have two daughters (brilliantly acted by Appatow's daughters) and a number of mounting adult problems all very timely whether you are poor or previously rich: debt, flagging careers, serious in-law challenges, mortgage payments in arrears, amongst many others. The movie shows both the strength of the marriage but also the weaknesses of the marriage, which by the movie's end almost breaks them up. Question: "What's the difference between a gay man's beard and a straight man's beard. Answer: "The smell." I HOWL just writing this. There have been many funny films this year. 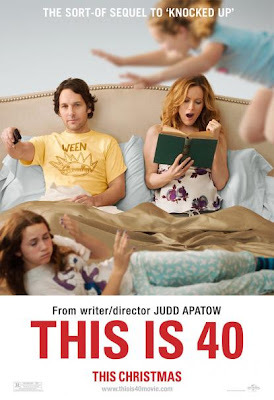 Perhaps the one that I think truly is a close second to This Is 40 was the brilliant Bernie (Jack Black/Shirley MacLaine) which is a faux documentary film that uses real-life people from the original story and incorporates actors who play the leads (Black and McLaine and Matthew McConaughey who hails from the state of Texas). Perhaps, I appreciated the humor even more so because I am a former Texan. Anyone from Texas can enjoy the film, though. Although sometimes Texans lack the ability to have any sense of humor about themselves and their beloved state. "Anyone in town would 'ave shot 'er for five dollars." I simply adore this character. Go see This Is 40. And rent Bernie. Another honorable mention in comedy was TED. I can't believe that I enjoyed this film because it has so much scatological, straight boy humor, which I normally find repulsive. But I truly laughed throughout the movie.